Food companies are sneaky. Through savvy marketing, they’ll make you think their product is the cream of the crop in health. Unfortunately, this is true even of packaged products in natural and organic food markets. Labels like “organic,” “gluten free,” and “vegan” as enticing. And while whole foods (the ones that don’t need a label) with these descriptions are usually great for you, packaged products can sadly make these claims even if the contents contain mostly junk. Companies can use all types of wording and natural-looking packaging to make their snacks seem health-promoting, but that doesn’t make it so. The next time you’re reaching for a snack food because it looks healthier than the other options, practice a little skepticism. Ignore the wording on the front and look at the actually ingredients. If the product says, “whole grain,” does it actually contain whole grains as one of the first ingredients? Does it have a lot of sugar (a lot of packaged products will use different names for sugars in their ingredients, so look out for several)? Does it contain processed oils? Is IS possible to find semi-healthy foods that are packaged, but the majority aren’t that great. So be careful to analyze the ingredients first before choosing. If you’re struggling to lose weight, Pounds and Inches Drops are designed for rapid weight loss. By resetting your metabolism and cravings, Pounds and Inches Drops help you lose the pounds from all the right places. They even include a doctor-created meal plan, protocol, and tips for success. Order some for yourself here! Breads at the grocery store can really be a hit or miss. Due to coloring, some breads that claim to contain “whole grain” will look more wholesome than that actually are. If you look at the ingredients, you’ll see that maybe the bread does contain whole grains somewhere, but the first ingredient is unenriched or enriched wheat flour, which just means it’s white flour that lacks very little nutrition. And choosing gluten free doesn’t always mean good, either. Unfortunately, a lot of the gluten free breads are full of oils and even more processed than whole wheat breads. The best place to start is the frozen food section, as a lot of the healthier breads are kept there. Look for sprouted grain breads that contain only whole grains and perhaps a little salt. This one can be a real doozy. Stores are FULL of all types of health bars, from protein bars for fitness buffs to weight loss bars to fruit and nut bars. Some of these can be okay, but beware of added sugar here. A lot of companies will use terms like “natural cane sugar” or “evaporated cane juice” to include sugar while still making it seem healthy. The truth? all sugars are the same nutritionally. Like with the other products, look at the label. Check out the amount of carbs, protein, fat, and sugar in the bar. Look at the ingredients to see where they’re coming from. But by now, you know better. 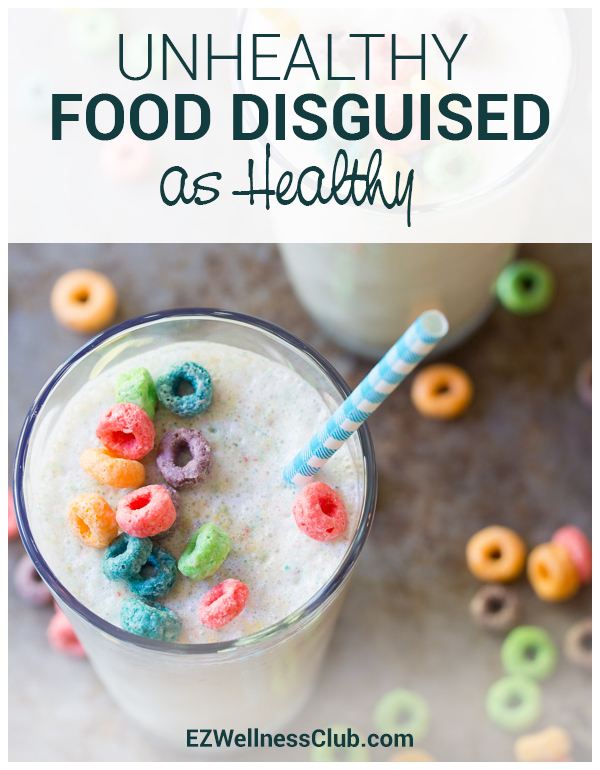 And it’s not just the colored sugary cereals; some healthier cereals still contain too much sugar and processed carbs. So take a look at the ingredients and use your good judgment. Or, better yet, buy some oats and make some wholesome oatmeal with fruit, nuts, and milk for breakfast instead. Trail mix is often packed with sugar and oils, too. It should just be made from nuts, seeds, and dried fruits. But a lot of them use dried fruits containing sugar and nuts and seeds that contain processed oils. Some also contain chocolate and other mix-ins that really aren’t health-promoting at all. Look for any brands that contain no added sugars or oils. And if you can’t find them, make your own at home so you can control the ingredients! Moral of the story: don’t take the claims on a packaged food at face value. Do some more probing by examining the nutrition labels first. And remember that the best approach is to reach for whole food sources like fruit, veggies, and raw nuts or seeds.